Eco-Friendly Family Beach Vacation Near Puerta Vallarta, Mexico! Costalegre, Mexico, June 20, 2012: This summer, families can frolic in a 1,500-acre nature preserve and experience a luxury villa vacation at world-renowned Las Alamandas (www.alamandas.com) in Costalegre, Mexico with an affordable new package that includes many special extras. Spend quality time with your entire family staying in a beautiful suite by the Pacific, in a gorgeous and relaxing tropical haven, enjoying everything from a family beach picnic and boat excursions in an eco reserve to surfing, horseback riding and kayaking. Las Alamandas has it all for families in the summertime: Balmy weather, warm water for swimming and water sports, numerous activities and facilities, exceptionally spacious and luxurious acommodations, and a secluded ambiance set with its own private nature reserve that is ideal for family bonding, spending intimate time together and creating lasting memories. Families may dine in their suite or al fresco at the Oasis Restaurant and oceanside at La Palapa Beach Club. The sophisticated, delicious and healthy cuisine is prepared with seafood freshly caught by local fisherman, meats and free-range eggs and chicken raised by local farmers, and vegetables, lettuces, herbs and fruits grown in the resort’s own organic gardens. There are activities for every member of the family including: lighted tennis court, beach volleyball, half basketball court, croquet, lawn chess, mountain bikes, 60-foot swimming pool, fully equipped air-conditioned gym, ping-pong, horseback riding, bird watching, kayaks (doubles and singles), hiking, surfing and boogie boarding. A Kids Club offers a program of games, arts and crafts, and activities. A lounge with a big-screen TV is an ideal family gathering spot to watch movies together. Las Alamandas is an all-suite boutique resort accommodating up to 42 guests on 1,500 secluded acres of unspoiled tropical paradise located midway between Puerto Vallarta and Manzanillo along the famed Costalegre region of Mexico. The resort is ideal for multiple generations who want both privacy and togetherness time while on a family vacation. The 16 extraordinarily spacious and beautifully appointed suites are located within seven villas with vibrant contemporary Mexican chic décor. The suites are designed for casual indoor-outdoor living with spacious terraces and patios, panoramic views, and most with a private Jacuzzi. 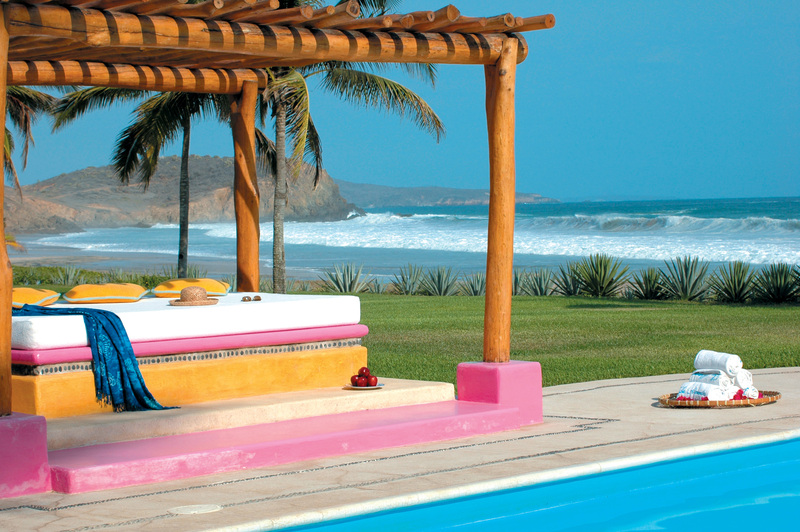 Las Alamandas boasts one of the most beautiful natural environments of any resort. It is nestled on its own private sweep of white-sand beach, with a rocky cape at both ends, amid verdant gardens of towering palms, flowing fountains, expansive lawns and flowering plants – including the resort’s namesake yellow La Alamandas, also known as the Copa de Oro. All around are untouched beaches where sea turtles lay their eggs, lagoons and streams that are habitats for numerous species of birds, jungle terrain traversed by trails that are ideal for biking and hiking, and lookout points with dramatic panoramas of the coast. For more information and to book the Summer Luxury Family Getaway: Toll free in U.S. and Canada 888-882-9616; Tel. + (52) 322 285-5500; info@alamandas.com. Compare this deal with our other family resorts near Puerta Vallarta, Mexico and enjoy our Best Rate Guarantee! We are going for holiday in beaches the eco-friendly environment is very important. Because that is the great think about this when we are going any place the eco- friendly environment is must. Really nice blog thanks for share with us.